How is your tie collection these days? The necktie-shirt combination is one of few ways men have to express themselves while dressing more formally. Of course, there is also some potential in the necktie-shirt-jacket combination, and a great pair of shoes is nothing to pooh-pooh. If you’ve been missing out on these opportunities, I hope you will be inspired by some stylish tie wearers I’ve caught at work and on the street. There are great ideas to be had here! Before we begin with musings about our tie-wearing muses, I first want to share a couple of great outside posts on the best way to tie a necktie (click here) and selecting a tie of fine quality fabric and construction (click here). 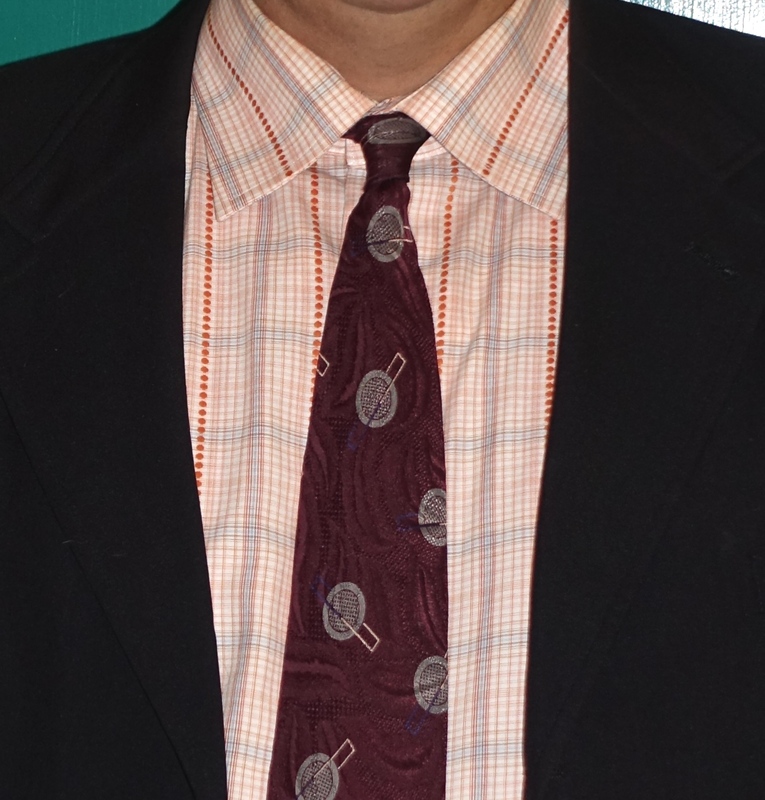 As for my own perceptions, I am partial to ties which are not too wide (think game show host or used car salesmen – ewww!) That means from about three to three and a half inches across. Of course, if a man is more robust, a wider tie works better, and a very slender man benefits by going the opposite direction; after all, it is a matter of proportion. Then we have length. My preference is for the tie to hit somewhere between the top and middle of the belt. When it comes to color and patterns, now that is where we can have fun. It is what allows a gentleman to highlight his own coloring, express a mood and/or showcase creativity. Ryan below demonstrates a clever use of color. 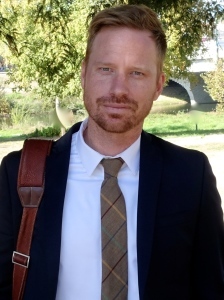 The warm brown necktie with stripes of burgundy, yellow and blue flatters his natural coloring and ties together his navy blue suit and auburn colored hair. Archie similarly demonstrates excellent color choices. His palette pictured below is exquisite (so subtle!) and the contrast with his coloring is splendid. Notice that his tie is slightly wider than Ryan’s (in the photo above). Archie’s collar is correspondingly larger – as it should be for balance and consistency. Our third gentleman muse is wearing the iconic (red) “power tie”, but rather than wearing it with the more formal crisp white shirt (with French cuffs and cuff links if you really want to go fancy!) he pairs it with a red, black and white windowpane plaid. The combination looks awesome with his salt and pepper hair color and red glasses frames, don’t you think? Last weekend, a friend introduced me to the Thomas Pink® store in San Francisco. 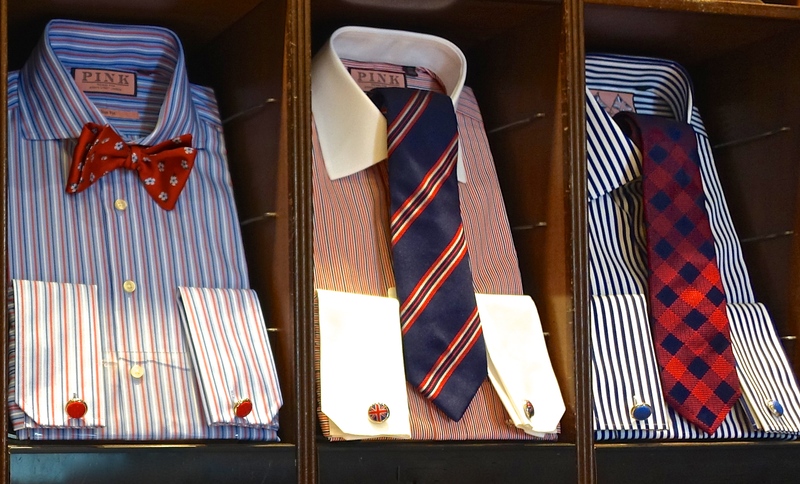 If you like tie/shirt combinations, you simply must check it out, and ask to see the French cuffs! I couldn’t get enough of the displays. I especially like the necktie-shirt combination on the left below: a tie with medium sized flowers and shirt of narrow stripes (both in yellow and blue). When combining patterns, it is important to vary the size of the pattern – particularly if you are combining stripes! The patterns in the example to the right are a little too similar for my taste: both the polka dots and plaid are small/close set, and the result is more dizzying than dazzling. Michael. our next muse, wears smallish polka dots with small stripes, but it works because the polka dots are set enough apart. 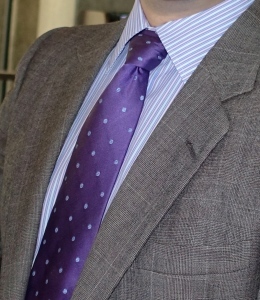 Shades of purple and blue in the tie and shirt coordinate nicely with the black on beige Prince of Wales plaid jacket. The three patterns are interesting and complimentary: very successful. I think it is awesome that more and more men are embracing the color pink: at least in shirts and ties. Woohoo! Rather than looking feminine, in my opinion, it gives off a sophisticated, cosmopolitan vibe – that is, if it coordinates nicely with the wearer’s personal coloring. It would not be my first choice for someone with auburn hair, for example. 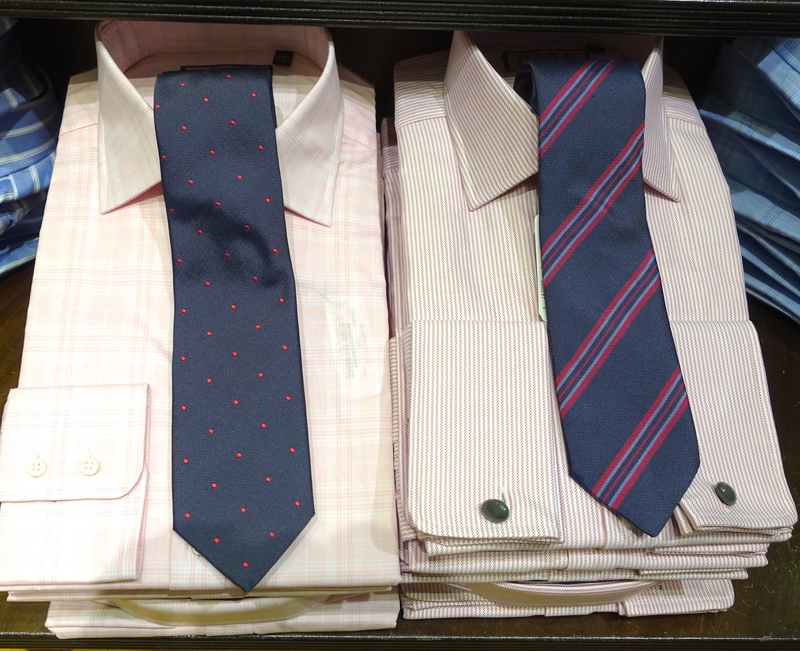 The ties below primarily in navy blue are a perfect choice with the pale pink shirts. 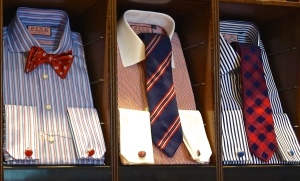 Notice how well the tie of wider stripes coordinates with the shirt of smaller, thinner stripes. 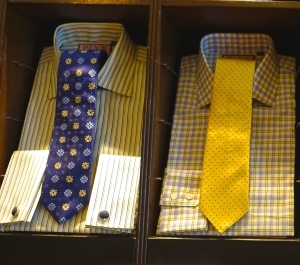 Shirt-tie pairings displayed at the San Francisco Union Square Thomas Pink ® store. My colleague Paul, pictured below, demonstrates daring and a true flair for combining color and patterns – evidence of his Italian heritage perhaps? By combining a pink shirt with orange detail and burgundy tie with grey detail under a black suit jacket, he has created a sumptuous ensemble: very pleasing to the eye, don’t you think? Zach demonstrates another rich-looking necktie-shirt combination of azure blue, dark brown and beige which compliments his own coloring. Although it is not as common to see a tie which is considerably darker than the suit jacket, Zach pulls it off by combining one with a shirt in a bolder hue. Adding interest to the ensemble are the subtle patterns of his apparel: a houndstooth check in the shirt and wide set diamond shaped details in the tie. Another display from the Pink ® store featured below shows great combinations to the left and center. 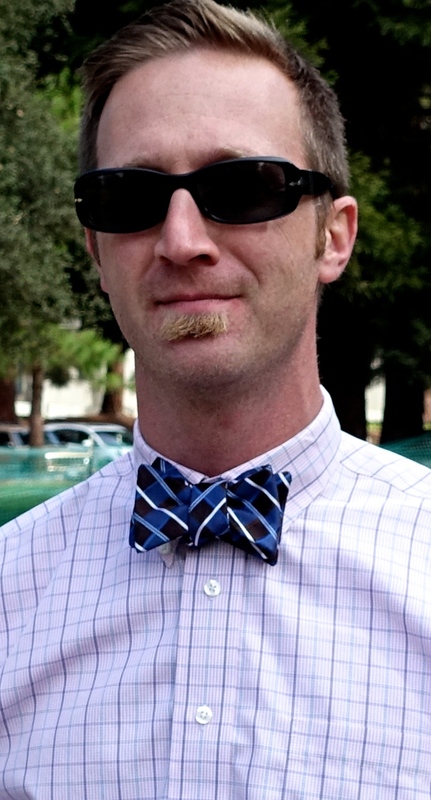 The flower pattern of the bow tie to the left looks awesome with the striped shirt. 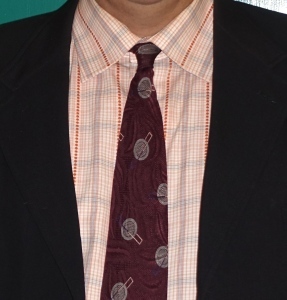 I think it works so well because the tie is bold, but the shirt is not so stark as to compete with it for attention. 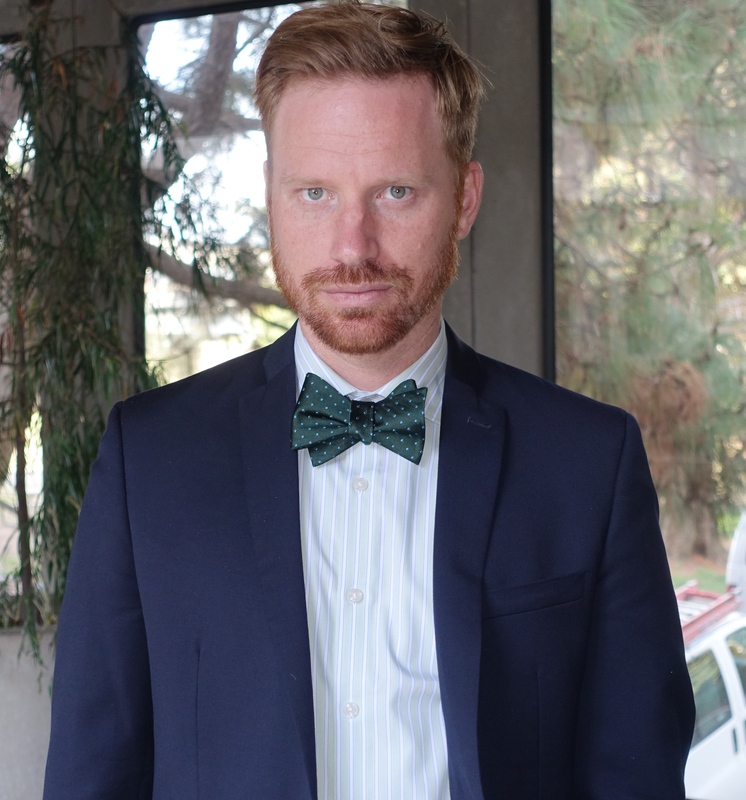 It is probably also helpful that the tie is a (smaller) bow tie rather than a standard necktie. We can see a contrast between this and the example to the right; there the tie and shirt seem to be rivals for attention. I also give the middle display a thumbs up. 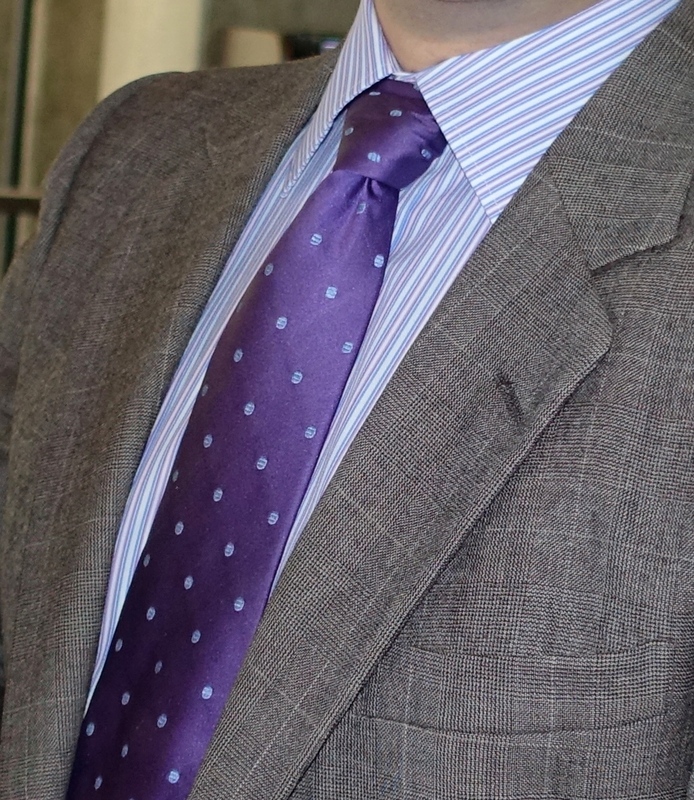 The shirt of small stripes coordinates well with the tie of large diagonal stripes. 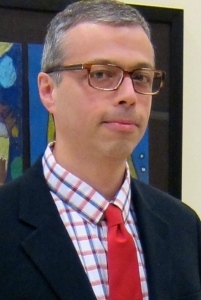 And there is a sense of balance, since the tie is primarily blue with red stripes, while the shirt has more red stripes than blue. I love the clean white collar and cuffs: a great touch and some rest for the eyes! In my opinion, a bow tie elevates a man’s level of style exponentially. The bow tie need not contain the same colors of the shirt. 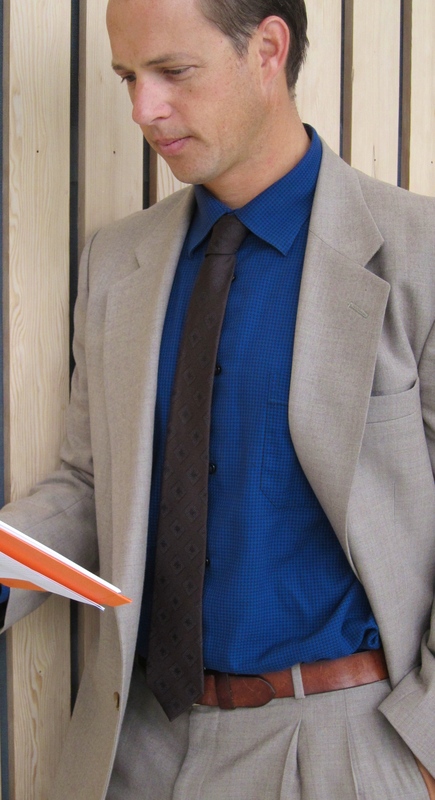 Either the shirt or tie can contain extra colors and still look great. Below we have a muse who combines a tie of blue, dark brown and white with a pink shirt with blue windowpane plaid. It works for me! Below we see another great color combination on my colleague Ryan. Blue and green perfectly compliment his blue eyes and auburn hair. The color selection also creates a wonderful sense of dimension: the pale green and blue striped shirt visually recedes into the background, while the navy blue suit jacket and emerald green bow tie with turquoise polka dots remain in the foreground. Of course, the shiny bow tie pops out the most. It is by far the main attraction – striking! The gentleman pictured below definitely has a knack with accessories. 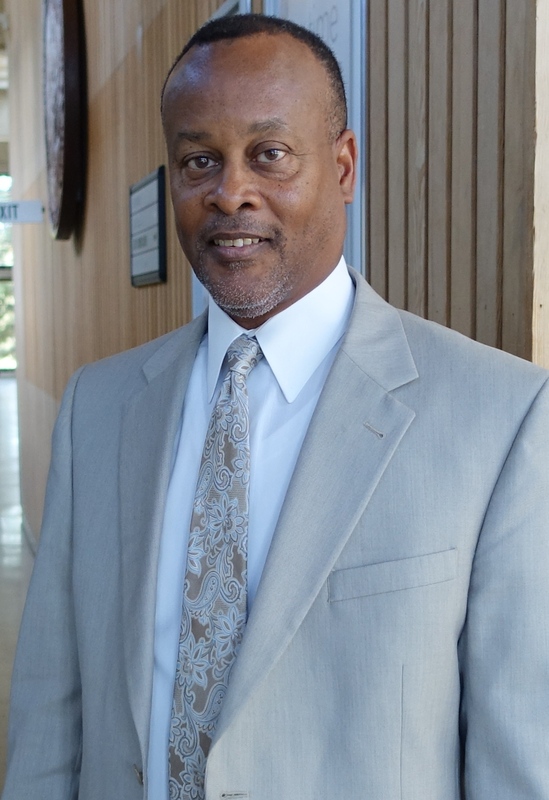 I love the way he chose a tie of the same hue as that of his shirt, the latter of which is more muted. 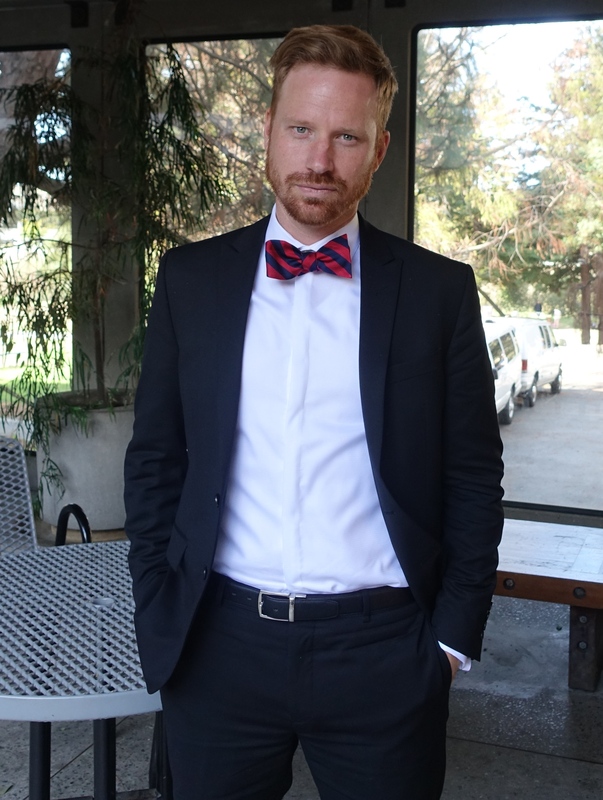 The polka dots and silky texture make the bow tie pop. The matching pocket square and lapel pin are also great details. All sorts of fashion bloggers warn against wearing a black suit in a corporate environment and consider it too stark or formal for daytime wear. I beg to differ! You will too when you see the picture below. Check out the awesome white shirt with hidden button placket, which along with a black suit of clean lines provides the perfect backdrop for this utra cool red and blue striped bow tie. I would say it is a total success for any boardroom, hip office or courtroom, wouldn’t you? A lot of people seem to associate neckties with “restriction” or conformity. As you can see with our muses above, they can be the exact opposite: an accessory which allows greater freedom of expression, creativity and fun mixing textures, designs and colors. The bow tie is even a bigger statement. 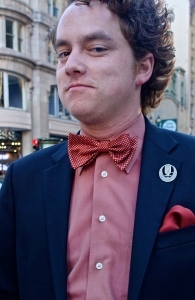 Ryan (pictured above) recently announced an intention to switch over completely to bow ties. All I can say is “Bravo!” Are you ready to give one a try?